After almost 4 years immersed in a lot of exciting challenges, it’s time to move on. When I started working at Globo.com, I realized that every if that I wrote would run in hundreds of thousands of computers around the country. Until then, I’ve only worked on small startups in the Northeast of Brazil where the impact of their products have smaller proportions. Describing this feeling is hard. I would argue that, for a software developer like me, knowing that your code is being used is as rewarding as receiving real money. During the time at Globo, I faced huge projects. As we’ve worked developing software for the video delivery stack, almost every big transmission - like elections or FIFA World Cup - had their special issues and corner cases. Following the trend, we developed a live video streaming stack from scratch and seeing this new infrastructure beating the concurrent users peak twice was priceless. 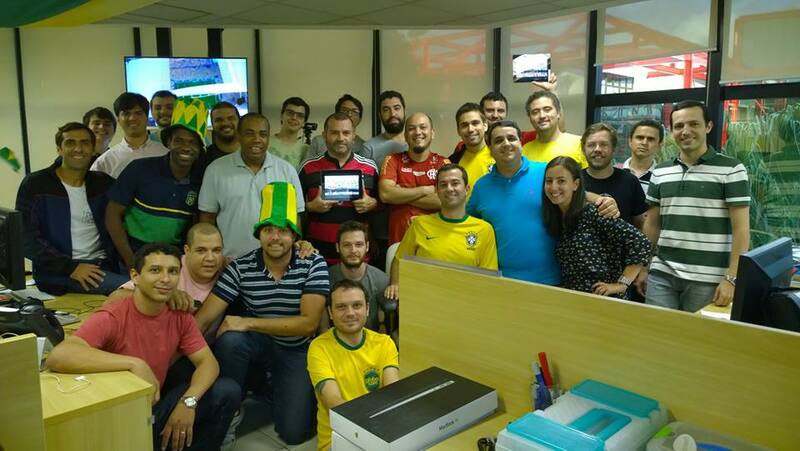 Part of WebMedia Team during the World Cup. We were still believing we would be Champions. I could also work with the most awesome engineers I’ve ever met. Sometimes I felt that the lunch time was kind of a graduate class (actually, I should had taken a pencil and paper to it). The discussions ranged from writing tests to how telecommunications works. Since the beginning of last year I’ve worked full time on an open source project which was the real reason for me to get up out of bed to go to work and sometimes even rise up early to answer one issue or fix a bug that someone dropped on github. I’ve already said this here but…Damn, how awesome is working with FOSS! About 6 months ago I was catching myself visiting LinkedIn, hypothetically looking for a new job, and this made me think that it was time to move on. I’ve read somewhere that when you’re feeling attracted by other opportunities, it’s a big red signal that you’re not happy anymore and need a change. I’ve applied to some companies and met a lot of great guys during the interviews but the last one was mind changing. I’m joining the Video Team at The New York Times. Next week I’m heading to New York to visit the office and meet my coworkers. I must say that I’m totally anxious and excited about it, but a lot of things need to happen before I move definitively to America. Until there, I’ll work remotely (which will be a challenge apart). I hope that everything that I lived these years were only the beginning and I’m sure I have a lot of things to learn. I’ll try hard to publish more posts regarding the obstacles I’ll face and I hope you’ll be cheering for me. Hey Feio, how is working at The Times?